"This bread is a little heavier than ordinary bread. But it is gluten-free and easy to make." To help insure success have all ingredients at room temperature before proceeding. Combine the white rice flour, brown rice flour, xanthan gum, and salt. Mix very well. The flours need to be completely combined. Combine the gelatin, sugar, egg replacer, milk powder, beaten eggs, vinegar and oil. Beat until well combined. Combine the flour mixture, egg mixture and yeast together and beat well. A standup mixture works best for this. Add tepid water to dough if mixture is to dry. The dough should be somewhere between a normal bread dough consistency and a batter. Pour into greased 9x5 inch bread pan and allow to rise in a warm, still place until doubled in bulk. Bake in a preheated oven at 325 degrees F (165 degrees C) until crust is a light to medium brown. Cool ten minutes in the pan, then to room temperature outside the pan before slicing. 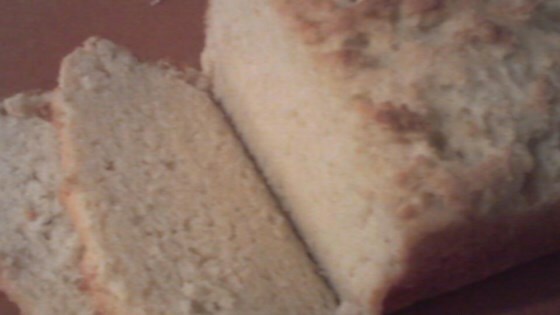 Light and fluffy and simple bread! I am on a Wheat and Dairy Free Diet for my Rhuematoid Arthritis and this recipe was great for me. It actually tasted normal and my family REALLY couldn't tell the difference!! I liked this recipe very much. I used four eggs instead of the egg substitute and olive oil instead of walnut oil. The texture is dense but for me that was a plus. Find a way to test for doneness; for me the center was not cooked enough. Taste is good. This is the first time I've made GF bread with yeast and I appreciated the extra tips about what the consistency should be. Dense but lightly sweet. It's a keeper. Thanks for sharing! !